A middleware is an object that wrapps the original application, hence the name. A middle is called between the application and the server. It can modify the response or the environment or route requests to different application objects. Middlewares and apps are agnostic to each other, so we can plumb any WSGI app to our middleware, and our middleware to any WSGI app. 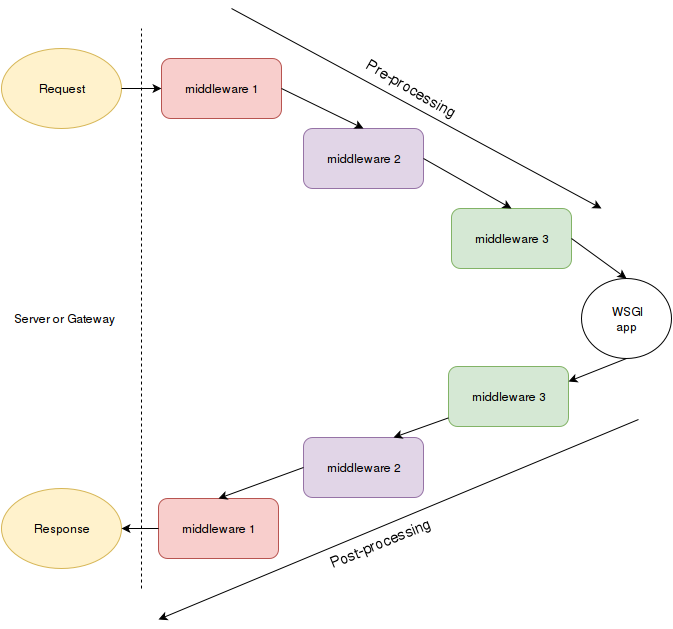 Middleware can be chained, allowing our response or request to go through mulitple phases of processing. Django imports these middlewares from the their specified module and plumbs them one after another. Let’s see how we can do that too. Bottle hides the fact the the app.install command is wrapping your application with a call plugin which takes place before your application and after your application login. These action could be for example opening and closing connections to the database before and after the request if needed. """print the envrionment dictionary to the console"""
Implement your own middleware which capitalizes the response you original application return. strings which can be capitlized"""
app = reverser(reverser(app)) # should return Hello WSGI!